The unique quality of traditional signwriting is the personal touch and in this modern age we are now experiencing a renaissance in the hand crafted style. Listed buildings and characteristic public houses can be enhanced with unique high quality traditional methods. We also offer the rare service of glass gilding using 24 carot gold leaf which no modern material can equal in its lustre, or indeed its luxury. With 50 years of experience, our master gilder can create stunning pieces worthy even of royal attention - such is the reputation of Edge Signs that we have completed gilding projects for The Queen, amongst others over the years. 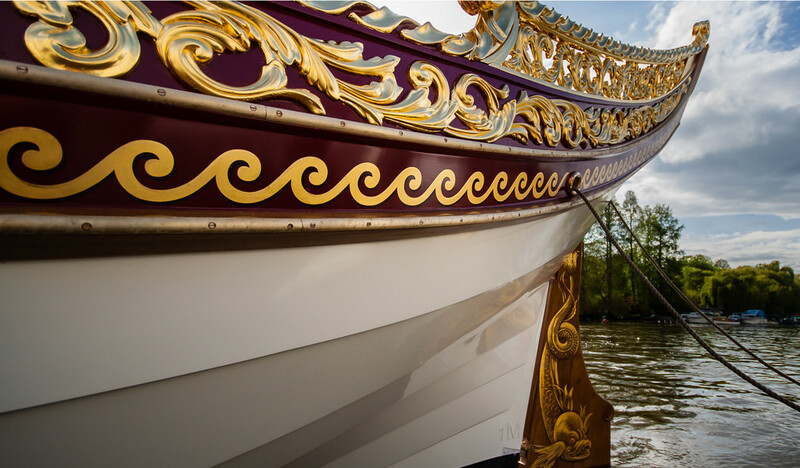 The Gloriana Royal Barge, commissioned to celebrate the Queen's diamond jubilee is just one example where Edge Signs have been the gilders of choice. It doesn't have to be a royal barge of course! - whatever the concept, Edge Signs will turn it into reality and by opting for gilding, you will create a centre piece to show off your business to existing and potential customers. Listed buildings require sympathetic signage and often regulations prohibit modern sign writing techniques anyway. Working within the guidelines, Edge Signs have all the skills, knowledge and experience to create the image your building requires, creating signs that compliment the age and style of the building whilst being the focal point that you desire. Often traditional really is best - Edge Signs have barrel loads of satisfied landlords to testify to this! We can help create the authentic look and feel that your pub deserves, by acknowledging the traditional methods used in sign writing inns of yesteryear, we can make your pub stand out from your competitors. Whether it is a full refurbishment, a spruce up or new signage for your pub, Edge Signs can achieve the traditional look and feel that old and new customers will love. Our client base reaches beyond the conventional customers normally associated with sign writing and into the world of art. Edge Signs have been commissioned by galleries and art exhibitions all over the globe - the United States, Brazil, Lebanon, France, Germany, Austria and Switzerland to name just a few! We have brought to life the vision of artists, whether large or small, modest or grand and Edge Signs have the skill and talent to realise your vision into reality.